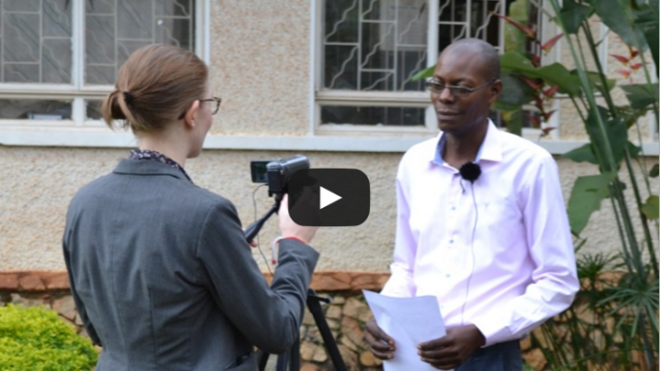 The Sweet Potato Virus Reversion Project (SPVRP), led by Dr Peter Wasswa at Makerere University, Kampala, aims to investigate the causes and mechanism for ‘reversion’ of sweet potato virus infection. With the project moving towards its conclusion, in February 2018 the AgShare.Today team travelled to Makerere to help visualize and process the SPVRP team’s data and cement the project’s legacy. While they were there, the AgShare team had the chance to meet with Dr Wasswa and catch up on the progress of the project and the achievements he and his team have made. Through their research, the SPVRP team have generated a great deal of knowledge about the genotypes of sweet potato varieties which show reversion, and those which do not. They also investigated the conditions in which reversion is most likely to occur. For example, they observed that reversion is seen more frequently at higher temperatures and in the presence of nitrogen-based fertilizers. Since the project began in 2014, a specialized virology lab has been constructed at Makerere. This lab is the first of its kind at the university, allowing researchers working on the SPVRP to use new techniques including ELISA tests, sample extractions and real-time PCR procedures. The lab also provides a modern space for the training of PhD and MSc students. The project’s collaboration with international partners has also created the opportunity for one such student to conduct research at the Agricultural Research Organization Volcani Center in Israel. This partnership opens the doors for knowledge sharing and further collaborative progress at both institutions. As the project continues, the SPVRP team aim to investigate the genes responsible for reversion in sweet potato. Finding the responsible genes would allow breeders to develop sweet potato cultivars which combine the traits of typically non-reverting varieties with the added reversion gene. This would have a significant impact on resilience of sweet potato crops to disease, improving food security and protecting the livelihoods of farmers.